Worth noting: The info presented by the Post for 2015 reports 138 concerts—even more than our calculations*—and 25 more than the previous year! The second article focuses more on the cachet, and potential loss thereof, associated with playing this iconic venue. Meanwhile, from our spot on the hill, last night (Disco Biscuits) was mellow, quiet even. Thank you!! The previous night (Rebelution) not so much. Please, if you are being disrupted by concert noise (or even if you’re not), be sure to keep recording your experience at the Sound Survey page, no matter how frustrating it is. People are watching and, other than direct feedback to the Mayor, it’s our best avenue for comment at the moment. We have to ask: Is there any end, or does this increase continue unchecked? * Here’s our graph from last year. Remember: for every story, there’s a flip side. Fox News coverage of 2015 Global Dub: “it’s like a James Taylor concert” says a neighbor. Flip side: that was Friday. Saturday night was another story, say neighbors! Flip side: Critics say planned construction will damage historic features in the park. See more at CBS Local. Some concert fans are opposed to parking lot paving. Denver’s Landmark Preservation Commission will consider the proposals Tuesday 5/19/15. Update: Skrillex concert reported to go as scheduled despite last night’s shooting, reports Chris Jose via Twitter. A little more press on Red Rocks noise concerns hit the streets this week, as Skrillex hits the Rocks tonight. First up was the Denver Post report by Josie Klemaier on Morrison’s plans to monitor EDM concerts. Reverb featured an interview with Skrillex today, and asked him about the noise restrictions at Red Rocks. Do regulations like these impact how you build your shows? Not really… I think **kids are having fun regardless, and I think a lot of the times sound is pushed harder than it needs to be**. I bring out my own sound system and my own sound techs. **We work hard to make sure the sound is at a comfortable level and not so loud** to the point where you’re like “[expl-deleted] this hurts”. Are these noise restrictions something you commonly have to deal with? Do you agree with it? I don’t look at anything as restrictions. Just challenges to be spontaneous. I think **as a concert goer you don’t notice these subtle differences**. If the vibe and energy of the crowd is on point and if you have a good lineup and a good venue people usually don’t complain about the stuff. We’ll roll out the noise surveys tonight as usual. Watch for it. Post Global Dub: The New Normal? 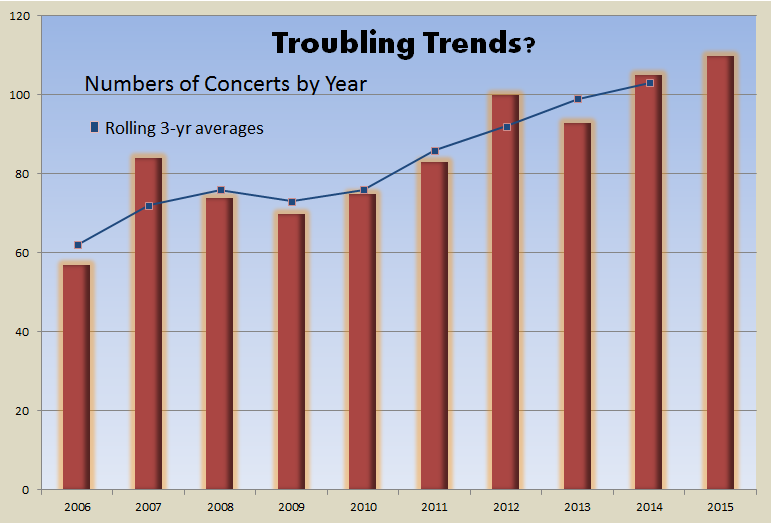 The first EDM concert of the season brought a lot of attention to focus on the issue of concert noise concerns. Here’s a quick reference page to recent press coverage, during and after the tour by Morrison, Jeffco, and Denver officials during Global Dub Friday night, May 16. Most of these have videos associated with them. but the Global Dub Festival maintained respectably low sound levels most of the evening. For those who haven’t attended, the Denver Post provided videos that capture some of the concert experience. The Daily Camera in Boulder picked up the Denver Post story: EDM fans, Red Rocks neighbors monitor noise. The Mayor of Morrison, along with Jefferson County commissioner Casey Tighe, went door-to-door during the concert, listening to the faint EDM sounds reverberating from Red Rocks. We wouldn’t say “happy,” KDVR, we’d say “cautiously optimistic.” Trust and verify. We remain hopeful that Denver intends to regain “good neighbor” status; we will continue to monitor what happens with the remaining concert season. With Bassnectar coming in just 10 days, we certainly hope so. Officials to see how noisy Red Rocks concerts are for nearby neighbors, posted May 15, 2014, 10:50 p.m.
VIDEO: Officials to see how noisy Red Rocks concerts are for nearby neighbors, posted May 15, 2014, 9:05 p.m.
How did we miss this? Apparently Westword has been keeping busy on Red Rocks issues lately. Could loud EDM music cause rocks to fall? April 4: Will there be a John Denver exhibit near you? In Friday’s The Denver Post, Teresa Keegan weighed in with an entertaining opinion piece to lighten the Red Rocks noise discussion. However, while Red Rocks’ noise-weary neighbors may yearn to hear only “The Sounds of Silence” emanating from that ancient sandstone edifice, to their credit, they are not pushing to cancel the entire 2014 electronic dance music — or EDM — concert lineup. …the dispute over decibel levels at Red Rocks becomes more about public health and less about a bunch of old coots spoiling all the fun for the “Come On Feel the Noise” crowd. CBS Local News followed suit with New Noise is Bad Noise, also on Monday. Then Tuesday, The Denver Post took a position, in an editorial supporting our concerns. See our post on that here. Interest at this new website grew through Wednesday and Thursday as we approached the meeting with Jeffco and Morrison; we posted our highest ever (so far) visits on Thursday. Reporters from The Denver Post, Fox 31 News, and CBS Local News attended the meeting, which we consider a good first step toward resolving the problem. Just before the meeting, Fox News visited Morrison and posted this video and story. “If we do diminish those levels, do we risk having those revenues go away?” Graves said of the money Denver collects from shows held at the vaunted sandstone venue. CBS Local News also covered the story, including an interview of area resident Hadi Soetrisno. If you haven’t been to a concert lately and want to get a feel for what they’re like, check out this photo gallery Slightly Stoopid posted of their non-EDM April 19 concert.